The stage is set: 16 teams and 80 players (96 if including their mandatory substitutes). With the Chinese and Korean regionals as well as the second International Wild Card Qualifiers concluded, we know the general shape and form of the upcoming League of Legends 2015 World Championship. It may actually be the most competitive season yet—at least since 2012. What used to be a foregone conclusion, that the top Korean team is all but guaranteed to come out with the title, is now heavily in dispute. Chinese teams LGD and Edward Gaming hotly contest the seemingly traditional esports dominance of their northern neighbors, and have a lot to back their opinion up. A lot, that is, in terms of raw funding: finally, after a year and an entire competitive season, the shadowy billionaires behind China's mass 2014 shopping spree of Korean powerhouse talents seek to reap the fruits of their harvest. The most alarming thing at Worlds this year: the best team might not actually have a #1 groups seed China's Edward Gaming has been a ruthless force all year, holding sway over the LoL Pro League circuit and winning the Mid-Season Invitational over reigning Korean champions SKT T1. Yet, despite their accomplishments, they stumbled at the finish line: China's #1 Groups seed fell into LGD's lap instead. While LGD's good (their carries in GODV—formerly Weiless—and Imp are the near-undisputed best of their respective roles) they weren't nearly as dominant as EDG through most of the year. There's plenty of factors relevant to LGD's surprise ascendancy, of course: patch changes, multi-week preparations specifically tailored against EDG, among others. But it was no surprise to anybody that EDG swiftly recovered and grabbed the #2 seed in the regional gauntlet soon after. That means disaster for some other region's top team—a potential upset before the group stage's even halfway complete. With China's de jure top team holding a "safe" seed, their de facto best is lurking in the shadows like a bomb waiting to go off. If placed in SKT T1's group, for example, it is not outside the realm of possibility that Faker and company actually fail to reach playoffs, sniped out of the starting gates by a combination of EDG's terrifying might and just one unlucky addition to their group. After all, both Taiwanese teams are in EDG's seeding group as well, along with Origen from Europe—and the group stage games are the most volatile by far. Of course, the odds of that are (to Korea's relief) under 25%. Both EDG needs to land in SKT T1's doorsteps, along with either or both ahq E-Sports Club and Origen. The odds are much greater that either Fnatic or Counter Logic Gaming gets to face the Chinese challenge instead—an exhausting prospect for Fnatic, whose early-game weaknesses were revealed during the EU LCS grand finals, and an almost cruel one for Counter Logic Gaming. Just when they've finally shaken off a multi-year curse. Not that CLG should mind if they flub out vs EDG or a similarly strong team, as just making it this far is cause for celebration among the team and its stalwart fans. And they certainly had to be stalwarts as they were disappointed for years at a time by the team's rough results and tense internal dynamics. It took a radical roster renovation, preserving only the bottom lane Rush Hour duo of Aphromoo and Doublelift, to finally break themselves free of their old bad habits. Mid and jungle are much more likely to cooperate these days, top lane's much less often a sacrificial lamb, and Doublelift actually sticks to teamfights instead of splitpushing at inconvenient moments! That's a radical departure of a general team play style that's haunted them through the other times they've overhauled their rosters—finally, it seems, the team's tired of losing. China's Invictus Gaming, the number three seed, has been similarly cursed. Once the only team that could've stood up to World Elite in their mutual primes, both they and Team WE have suffered a bout of misfortune in recent years, struggling to maintain relevance in the face of ambitious newcomers. IG's also an unfortunate example of the limitations inherent in international recruitment, as it took a long time for KaKAO and Rookie to gel with their teammates. The fact that KaKAO was rumored for most of the year to treat his stint in China as something of a vacation or retirement certainly didn't help, with his temperamental play style seemingly less effective than it was back home in the gaming studios of Seoul. But then Worlds neared, and KaKAO woke up. Third-favored team Qiao Gu Reapers, they of the silver and purple hair, were caught off-guard by iG's sudden resurgence in the regional gauntlet. The laughing jester of the jungle is back yet again to torment solo laners and troll the world's best carries—exactly where he belongs. Meanwhile, as usual, teams are begging and praying to be lined up with the international wild card teams—a polar contrast with the trepidation of an EDG matchup. And to be fair, though the IWCQ circuit was much livelier than in prior years (Turkey's defeat at the hands of both Australia's Chiefs and Southeast Asia's Bangkok Titans was largely unexpected), the quality of play from either of the qualifiers was lower than you'd get from most of the premier circuits. There is little reason to expect a repeat of Alliance vs Kabum!, like in 2014. As has been addressed by former members of the team, their problems last year stemmed from a combination of poor performance, resistance to coaching, and sheer arrogance—a situation that their defeat to last year's Brazilian representatives have done plenty to alleviate, at least for everybody else that want a chance at what Alliance got last time. Community and team analysts were keeping their eyes on the wild cards this year to a greater extent than any prior—largely with skepticism, but now and again an interesting play or strong matchup managed to impress even the most cynical. That said, they're still hoping for their own representatives to get slotted in with the Bangkok Titans. Southeast Asia's best was very literally their worst just a couple years ago—BKT was among the original Garena Premier League teams, all the way back to the prime of the Taipei Assassins, and spent two years of their existence at the very bottom of the standings. Their rise to the top is both a testament at their organization and players' tenacity in the face of overwhelming odds and criticism... and also, tragically, a testament of how much weaker the Southeast Asian circuit's gotten since the Taiwanese teams departed with all of the glory and Worlds seeds. But BKT's revival at least led to mid laner G4 and AD carry Lloyd gaining some hard-earned international respect. And their hard fight through the immensely competitive first qualifiers earned back their beleaguered region some of that lost prestige. Even without the Taiwanese teams clogging up the top of the GPL brackets, they were still more experienced and more developed than fellow Wild Card regions. Brazil's PaiN Gaming struggled far less in comparison, with almost no fanfare or drama to their clean and decisive dismantling of Latin America's Kaos Latin Gamers. The CBLoL competitive circuit may be one of the best-developed non-premier competitive circuits in the world, with only Turkey's and Southeast Asia's as peers, and it was aptly demonstrated in their takeover of the second qualifiers. In fact, Brazil has a proud history of unexpected competitiveness: it was at IEM Sao Paulo that Korea dropped their first-ever international game (though Incredible Miracle still won the 2012 tournament), and it was through Kabum that Europe's elites were embarrassed just last year. Though they can't hardly hope to actually win an event against the better-developed regions, they can earnestly attempt to spoil the results. 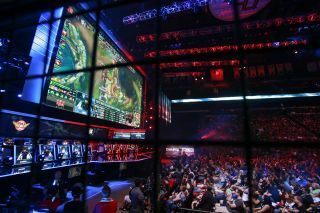 And in the process, take away a little something from the teams they face—lessons in what is possible at the razor's edge of competitive League of Legends, facing down pressures and strategies that even their best hometown rivals can't quite manage to pull off. In doing so, a region grows. An entire country of players learn to be better, to be more dangerous. Even if China and Korea are like gods unto their meager mortals... that's only this year. That's only for now. And even Faker didn't stay on top forever. This year's the most competitive Worlds that League of Legends has ever seen. Next year might very well leave it in the dust.